What is it about moving water that fascinates us? The grace and beauty of flowing water, along with its ability to induce calm, are the biggest reasons we’re drawn to artful displays of H2O. 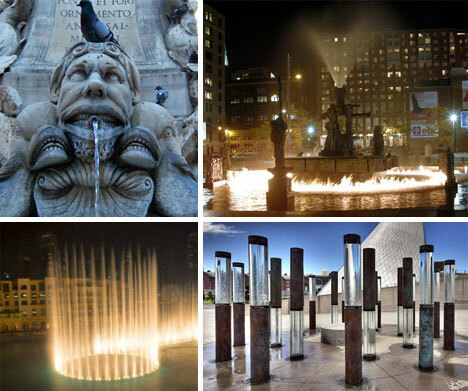 From simple gravity-driven fountains to elaborate displays of dancing water and lights, these fountains, waterfalls and water sculptures are among the most celebrated, the most beautiful and the most interesting in the world. 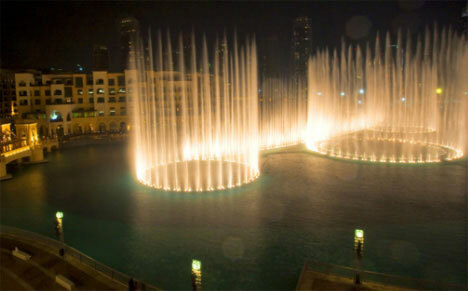 The Dubai Fountain in Burj Dubai, UAE is among the largest and most technologically advanced fountains in the world. 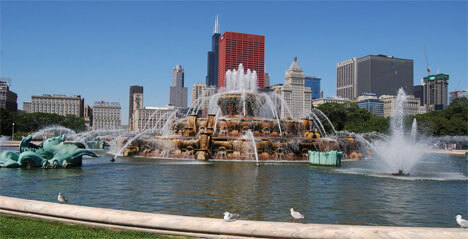 The $218 million fountain was unveiled in May of 2009. While it’s similar to the famed Bellagio Fountain in Las Vegas, it’s 25% bigger and boasts water sprays as high as a 50-story building. But even more impressive than the facts and figures is the sheer beauty of the lighted water show. It’s nothing short of breathtaking. In the summer of 2008, New Yorkers were treated to a large-scale public art project from Danish Artist Olafur Eliasson. 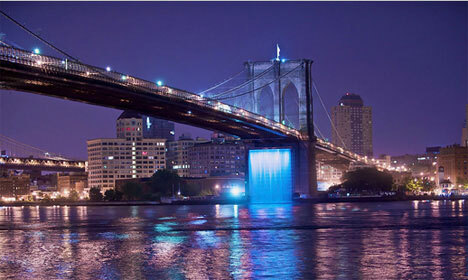 Four towering waterfalls were placed at different locations in New York Harbor. They were carefully designed to avoid damage to the environment and wildlife, and no public funds were used in the project. For a few months, these waterfalls provided passers-by with a stunning view of water toppling back to its home from 90 to 120 feet up. Hailed as the most ambitious public art project in New York in several years, the waterfalls were meant to be a celebration of the revitalization of the waterfront. 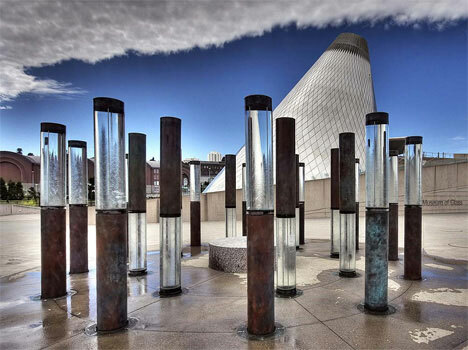 Just outside of the Museum of Glass in Tacoma, Washington, you’ll find a beautiful but beleaguered water sculpture project. The publicly-owned Water Forest was first erected in 2002, but was taken down soon after when one of the tubes was pushed over by a child. The city took the next seven years (and $174,000) to repair and improve the sculpture. The clear parts of the tubes, once made of glass, are now acrylic and much harder to damage. The 20 tubes have been made stronger to avoid any accidental injuries. The water flowing down the outside of each tube has been specially treated to avoid harming those who, for whatever reason, find it necessary to taste it. Overall, the display is breathtaking – especially at night, when green fiber-optic lights illuminate the structures. New Zealand sculptor Len Lye dreamed big – so big, in fact, that his sculpture concepts were mostly unrealized at the time of his death. He considered himself well before his time, as the structures he wanted to build were beyond the scope of technology in his lifetime. Following his death in 1980, two of his concepts have been made into reality. Water Whirler is one of these. The strong but flexible rod that makes up the central part of the sculpture features thin jets of water that spray out horizontally. As the rod whirls around and around on its base, the water jets form lovely and surprising patterns in the air. 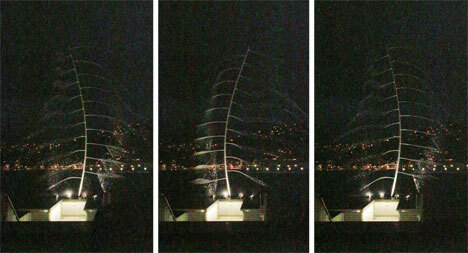 Water Whirler was unveiled in 2006 near Frank Kitts Park in Wellington. 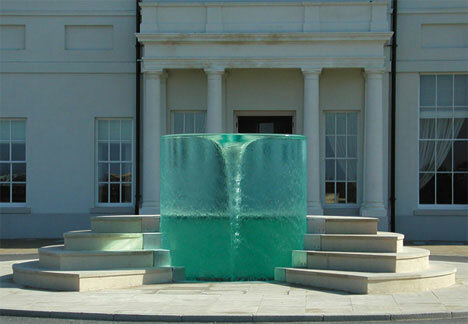 This mesmerizing water sculpture was designed by British sculptor William Pye and sits in front of Seaham Hall in Sunderland. The clear cylinder holds filtered water that rushes around to create a beautiful air-core vortex. Thanks to the stairs on either side of the cylinder, viewers are able to climb up and look down into the eye of the vortex. 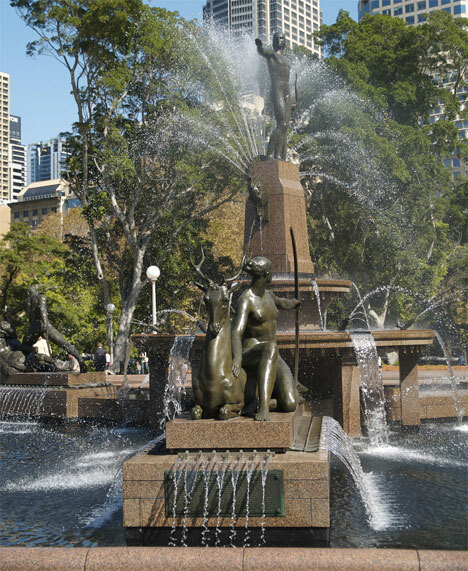 Unveiled in 1932, Archibald Fountain in Sydney, New South Wales, Australia has been called the country’s most impressive fountain. The funds for the fountain were provided by journalist J.F. 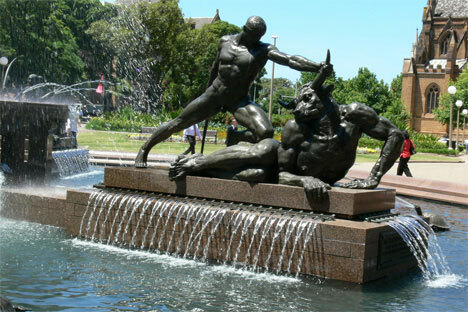 Archibald in his will, with the stipulation that the fountain must be created by a French artist. Francois Sicard was awarded the project and created a truly beautiful piece of art that has become the centerpiece of Hyde Park. 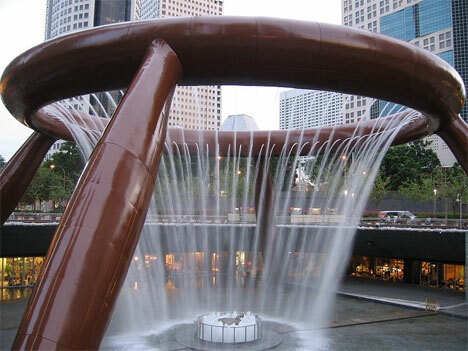 This gigantic fountain is the central feature of Suntec City mall in Singapore. The fountain stands at over 45 feet (13.8 meters) and is said to bring good fortune and wealth to those who walk around it three times while constantly touching the water. It was recorded in the 1998 Guinness Book of World Records as the world’s largest fountain. 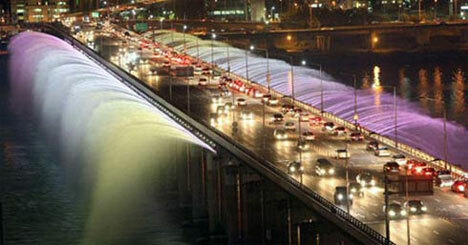 While it used to be a boring bridge over the Han River, the Banpo Bridge was transformed in 2008 into a gigantic, artful water display. The water is supplied by the river directly below and pumps through 9,380 nozzles to create this unique and memorable fountain. The bridge/fountain was intended to drive more tourism traffic to the city. The impressive Friendship of Nations fountain (also known as the People’s Friendship Fountain) is a unique display of 16 gilded statues, each representing one of the member nations of the former Soviet Union. The fountain sits in the large plaza just outside of the All-Russia Exhibition Center. 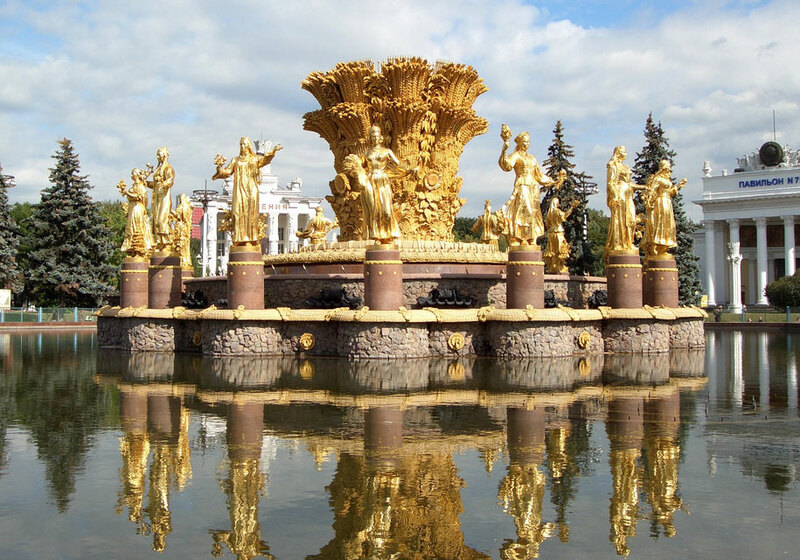 The fountain and the entire plaza in which it sits can’t be missed if you’re visiting Moscow – they are a fascinating bit of Russian history. If you walked past this outdoor clock quickly, you may not notice anything unusual about it. 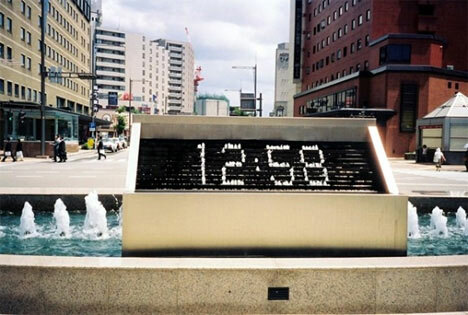 But this is no ordinary digital clock – it’s actually a fountain using small jets of water to tell the time. The water can even spell out messages in English and Japanese. The jets are controlled by a computer system that tells them when to open, when to close, and how high to spray the water. 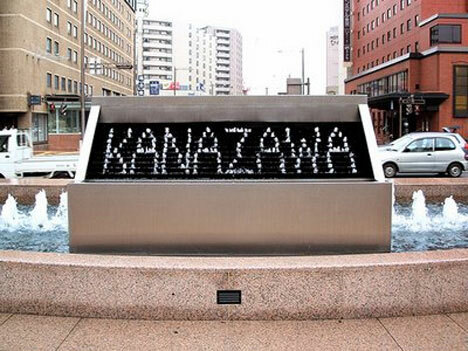 The Kanazawa Station Fountain Clock is an amazingly unique and beautiful water display. In the first video, this innovative fountain in the Canal City Mall uses falling droplets of water to shape words and pictures. The amazing display seems almost like magic, but it’s really just the perfectly-timed release of water from individual streams. The second video features just one of many such dancing water fountains in Japan, complete with soundtrack. The regular shows never fail to attract a crowd as the water seems to dance gracefully to the music. 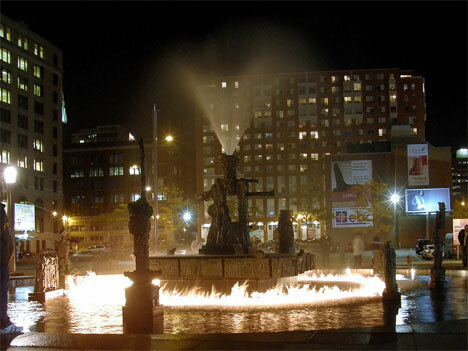 There are few water displays as dramatic as La Joute (“the joust”) Fountain in Montreal. The fountain runs on a 32-minute kinetic sequence that culminates on the hour with a stunning ring of fire encircling the central island. Created by Jean-Paul Riopelle in 1969, this unusual fountain currently sits in Place Jean-Paul-Riopelle in the Quartier International de Montreal. Buckingham Fountain, a Chicago landmark, has been gracing the city with its towering spouts of water and memorable light and music shows since 1927. Every hour on the hour from 8 a.m. to 11 p.m., from April to mid-October, the fountain marks the time by shooting a 150-foot spout of water into the air. The fountain is meant to represent Lake Michigan, while the four seahorses surrounding the central fountain symbolize the four states around the lake (Illinois, Michigan, Indiana and Wisconsin). 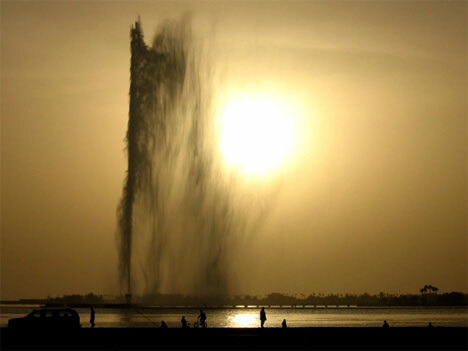 On the coast of Jeddah in Saudi Arabia, this impressive fountain dominates the horizon. King Fahd’s Fountain, which has been in operation since 1985, is the tallest water jet in the world. Its spray reaches over 850 feet above the Red Sea from which it draws water. A beautiful sight at any time of the day, it is especially so at night when more than 500 spotlights illuminate the massive water jet. 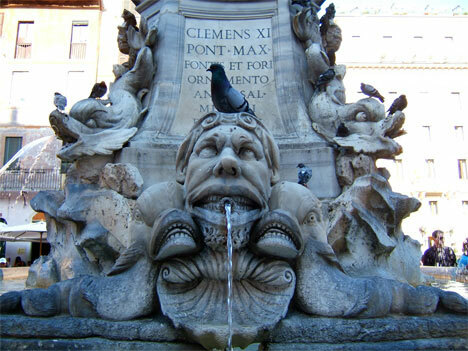 Of course, no article about beautiful fountains would be complete without a mention of the amazing fountains in Rome. The Italian city is famed for its many stunning fountains, and two of the most celebrated are the Fountain of the Pantheon and Trevi Fountain. The Fountain of the Pantheon was designed and sculpted in the 16th century and sits in the Piazza del Rotundo just in front of the Pantheon. The fountain itself and the marble figures there today are not the originals, but the fountain is still a magical part of Rome. Any trip to Rome must also include a visit to the Trevi Fountain, one of the world’s most well-known and loved fountains. 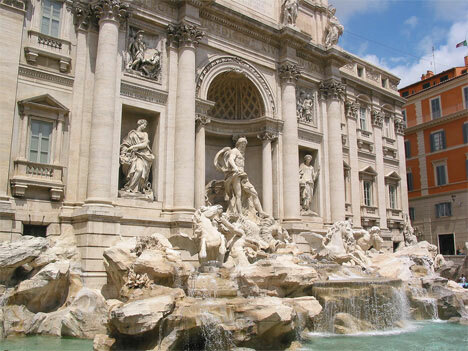 The Trevi Fountain has a long and interesting history, including many alterations and rebuildings. But today it remains an exceptional example of Italian sculpture and an icon of Rome itself.